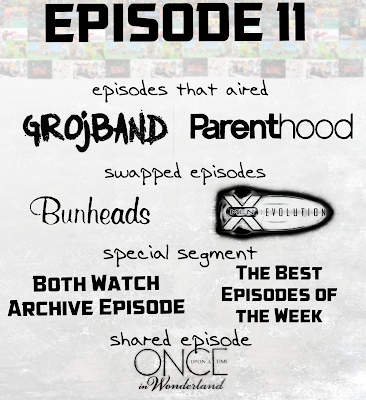 The eleventh episode of Show Talk aired on January 13th, 2014! See the full episode below: NOTE: We had technical difficulties at the end that were unknown to us while streaming. We will hopefully have it fixed by the next time we air. We review episodes of randomly selected shows that we watched that week. In the first half of this episode, the band travels to the underworld where elevator music is born and has to write elevator music that's actually cool to escape. In the second half, Cory buys a guitar that refuses to share the stage with any other instrument. Grojband is a weird, sometimes funny, formulaic show that's also strangely addictive, at least for me. This particular episode was pretty good. The premise of the first half was nice and ridiculous, and I feel like it was funnier and more concise then the second half, which was good enough, but ultimately skippable. I really enjoyed this week’s episode of “Parenthood” and it sort of makes me wish this one aired in 2013 so I could have added it to my top 10 best episodes list of 2013. In this episode Julia reveals to Joel that Ed kissed her, and when Joel asks why she didn’t tell him when he asked before, she claims that “Nothing happen from her end.” I found this idiotic and I don’t understand how you can think it was nothing to talk about even if it didn’t happen on her end. Sadly they didn’t really spend that much time on the Joel and Julia plotline which disappointed me a bit as I would have liked to see more of it from this episode. But it seems they’ll focus on it more it next time, and based on what Joel told Julia in at the end, it seems their marriage will be unfortunately coming to a close. We swap shows that we've watched in the past. This episode of “X-Men Evolution” was good. I had no idea who the assassin was in the beginning, but knew right away when I saw the two claws and I then knew exactly who it was and who this episode was going to be about and I was happy about it since I have never really known much about X-23. At first when seeing this version of Wolverine’s character, I wasn’t a big fan of the voice but it soon grew on me and the more I heard him speak the more I liked his voice. The head design for some of the females (Mainly Rogue and X-23) at certain points in the show looked like male heads and it was sort of hard to look past. Comparing this to the other X-Men episode I watched from “Wolverine and the X-Men”, I would have to say I enjoyed this slightly more. But that’s just basing off of one episode and not an entire series. In this highly dramatic episode of Bunheads, the ballet school preforms Nutcracker, but nothing really goes as planned and the episode ends on a low note. This episode was funny at times, but there were moments that made me unsure whether it was a sitcom and or a drama. I guess it's a dramcom. The idea of it is interesting and unique - I'm glad it isn't just another show about a crazy family, though there is craziness to be had. The plot was very well structured and though the humor was hit and miss for me when it worked it was okay. The biggest complaint I can make about it is that I had to hear that incredibly irritating Nutcracker music for longer then I'd have liked to. All the ideas that couldn't fit in the current show are stuffed in this segment! There's two parts to this segment, the feature and the accessory. The feature is like our normal review segments, but with a fun twist. The accessory follows the feature segment, and is usually a game about the shows we watch. There are archive shows that we've both watched. We'll pick our favorite episodes from the show to review, they don't necessarily have to be the same episode, but if they are then we'll average the score. Top 3 Best Episodes that week, and why we liked them. Can be for shows we didn't review as well as shows we reviewed. We both review the same episode of a show we both watch. This was one of the more interesting episodes of an already interesting show. The choices that were made, especially at the end, are exciting and I can't wait to see where they will lead in the second half of the season. Also, there was a surprising cameo in this episode that I won't spoil, but added to how enjoyable it was. There were some moments where the CGI wasn't blending too well, and the effects all around were passable, but not as good as the pilot's, at least until the very end. The show's been great so far, so I'm glad this is just a winter hiatus and not a finale. “Once Upon a Time in Wonderland” is getting better and better since the last time I watched it which is the last time I reviewed it. The ending to this episode was excellent, as it opens a new plotline for the show so it’s not just about having Alice reunite with Cyrus. Already I can see where the writers are going with this and here is my theory: Alice and the rest of her team are now going to have to rescue Will before Jafar can get to him, but they’re also going to have to find a way to free Will without having Cyrus ending up as a Genie again. To do that they’re going to most likely need a replacement for Will and that replacement being Jafar. Why do I think it’s Jafar? It’s because in the Disney version of “Aladin” they stop Jafar by tricking him to wish to become a Genie so he would end up in the lamp and so it’s most likely how they’re going to stop him at the end of the season. But then with Jafar stopped and trapped in the bottle, who is next to be the main villain? My theory is Jafar’s lover that is currently his staff. Next week we're adding Gravity Falls and Log Horizon to Harryhausen's list. Next time, we'll be reviewing Gravity Falls and New Girl, and we'll be swapping the shows Bleach and Big Bang Theory, and we'll both review Arrow. For the "feature", it'll be Reality Show Review, followed by the "accessory", The Shipping Game! The tenth episode of Show Talk aired on January 5th, 2014! Green Goblin turns Spiderman's teammates into Goblins and uses them to distract Spiderman so that he can Goblinize New York. This episode comes in number two on my top ten list of the year. The "Episodes I Wish I Didn't Have to Watch" list that is. If you're wondering whether the plot has any depth, subplots, or character development beyond that description, it doesn't. There's not much else to say about this except that I will not be returning to watch the theoretical third season of this show. The only high point of the episode was the flashbacks of past episodes. Ouch. I highly enjoyed this episode of “The Big Bang Theory” but I realized something this time that I never realized before. Penny gets a small role on the show “NCIS” but is disappointed to find out that her part gets cut. So Leonard goes to try and comfort her, but fails to do so and makes the situation worse. So the next day he comes back to try and fix things by giving her a casting call sheet for the new “Star Wars” film, but just ends up making the situation worse. What I am trying to say is that there is always some sort of variation of that scenario every once and a while that it’s becoming annoying and I’m tired of seeing it. Now Leonard’s relationship with Penny is in jeopardy (again) because he refused a drunken marriage proposal from her, and I don’t think he was wrong for doing so. Because if he had she would have yelled at him the next day for taking advantage of her and that would have made the situation even more annoying. I think she’ll be over it by the next episode. We swap shows that we currently watch. This episode of “Ben 10 Omniverse” was a little better than I thought it would be. I always enjoy the alternate universe type of episodes because it’s interesting to see how one universe differs from another. The art style was great since it was done by Derrick J. Wyatt whose art I highly enjoy, and there were some great voice actors like Tara Strong and David Kaye. I enjoyed the characters of Blukic and Driba the most because they are the most interesting characters of the show to me, and I enjoy hearing their funny little voices. Now to wrap up this review I’ll say this isn’t one of my favorite shows that I have seen, but it’s still not the worst. Finch gets the number of what seems like a typical family man, but he soon realizes that there's more going on then at first appears. This episode had a bit of a rough start in my opinion, but as the plot started to hint at something bigger then the perp or victim premise, it got better. And, surprisingly, it was funnier then I'd thought it would be. The sizzle reel at Comic Con that I watched of Reece shooting people's kneecaps didn't really sell that part of the show, which is a shame since it's a good reason to watch it. I appreciated the ending, which was a great way to open an arc. The characters need a little more personality though. Not sure how I feel about sitting through two seasons of a shy calm nerd guy and a violent calm action guy. In every arced series, there's usually at least one episode that serves no other purpose then padding. We review episodes like this from series we watch or have watched! We review a theme song from a show the other person watches. Theme songs are chosen, not randomly picked. Rating is divided into "Catchy-ness", "Flow", "Embarrassment Factor" and "Overall". A section of the theme song is played on the show during this segment! After Ichabod finds out that he has a son, he asks Henry Parish to help him talk to Katrina for answers, but is threatened by the golem that his son created in lieu of Ichabod's fathering. This was one of the more enjoyable episodes. I'm familiar with golems, and while I wish they'd tied it in with some of the more interesting mythology there, it was still fun to see. The monsters on this show are usually well done. It was also nice to see some backstory for Frank. However, the show got a little silly at times, especially whenever they read from the Testament. This episode of “Sleepy Hollow” was good. It wasn’t one of my favorite episodes, but still wasn’t my least. I’m glad they brought back John Nobel’s character ‘The Sin Eater’ for this episode as I highly enjoyed his performance the last time he was on it and his acting on the show this time was fantastic as well. I’m glad they were able to tone down the gruesomeness a bit as it was a little offsetting for me and made me question multiple times if I should drop the show. I’m also really enjoying the background music as it’s one of the best parts of the shows and am hoping they release a soundtrack for it. If my wish for an “Arrow” soundtrack came true before, perhaps a soundtrack for Sleepy Hollow will come true as well. And now, because it's the new year, here's our Top Ten Episodes of 2013! #10 Transformers: Prime “Deadlock”: One of the best episodes of the seasons. The battle was exciting, I almost cried at Bumblebee’s death, and Bumblebee also gets his voice back. #9 The Office “Finale”: A fantastic ending to the series. It was nice that Steve Carell came back for the finale as he was one of my favorite parts. I’m sad to see the show go. #8 New Girl “Keaton”: This was a great episode and I highly enjoyed it. It was amusing to watch Jess and Nick try to keep the ‘Magic of Michael Keaton’ going for Schmidt. #7 Parenthood “Speaking of Baggage”: A personal favorite of mine mainly because of the great performance by the band, and it had an interesting plot line. #6 Agents of S.H.I.E.L.D. “The Asset”: This was a great episode and a big turning point in the series and it’s what made me enjoy the show more. It proved it wasn’t just going to be a show about hunting down “unregistered gifted”. #5 Once Upon a Time “Think Lovely Thoughts”: So far it is my favorite episode of the season and the twist of Peter Pan being Gold’s father was excellent. #4 Person of Interest “2ttR”: This is one of my favorite episodes of the series. It was interesting to watch Finch protect the latest person of interest and the episode was amazing overall. #3 Nashville “I’ll Never Get Out of This World Alive”: I highly enjoyed this episode a lot. Two of the reasons being the awesome performance Juliette gave at the end, and Maddie finds out the Deacon is her father. #2 Arrow “Three Ghosts”: This was an epic cliffhanger episode and one of my favorites of Season 2 so far. Was happy to see Slade was alive in present day, but not so happy to see that he wants to kill Oliver. I was also happy that Tommy even got a cameo. #1 Arrow “Sacrifice”: This was the best episode of Season 1 (In my opinion) and a great ending to the Season. #10 Once Upon a Time in Wonderland S1 EP1: I've really enjoyed this series, and this episode was great. It introduced new characters and set up an intriguing story. #9 Elementary S2 EP1: While there wasn't much mystery to be found in this episode, the introduction of Mycroft and getting to see 221B Baker Street was just the thing the kick off the season. #8 Once Upon a Time in Wonderland S1 EP7: Though this episode didn't really work until the end, it was still a great episode and one of my favorites of the whole show. #7 Once Upon a Time S3 EP4: Tinkerbell's introductory episode. It felt like the season was finally picking up the pace here. 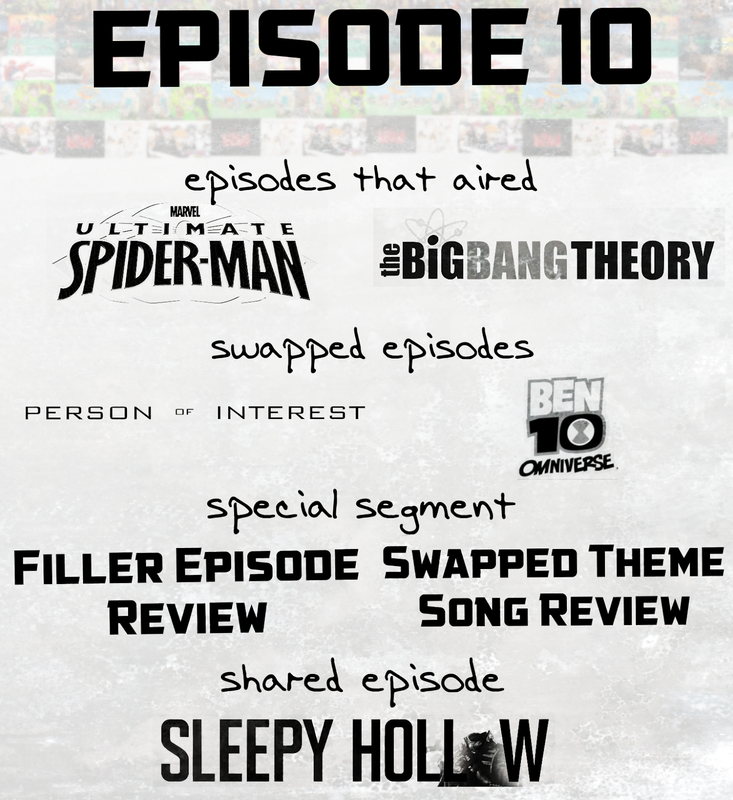 #6 Ultimate Spiderman S2 EP15: Bet you didn't think an Ultimate Spiderman episode would be on here! This episode is easily the best episode of the show. I've watched it three times now - willingly! #5 Arrow S1 FINALE: Everything the show had put forth so far paled in comparison to this wonderful season finale. #4 The World God Only Knows S3 EP7: This was the best episode of the season and maybe even the whole show, it's filled with tension and the whole situation is great. #3 Agents of S.H.I.E.L.D. S1 EP6: Easily the best episode of the show so far. Maybe it's just that my favorite character was featured, but this episode also seemed heavier then the show's usual light tone, which I enjoyed. #2 Legend of Korra S2 E5: The show finally found a proper outlet of humor in the form of Varrick, and this whole episode was incredibly entertaining as a whole. #1 Elementary S1 EP13: The best case on the show, and the most original and clever one to come out of the series. Harryhausen is dropping Sleepy Hollow and we're both dropping Avengers Assemble. 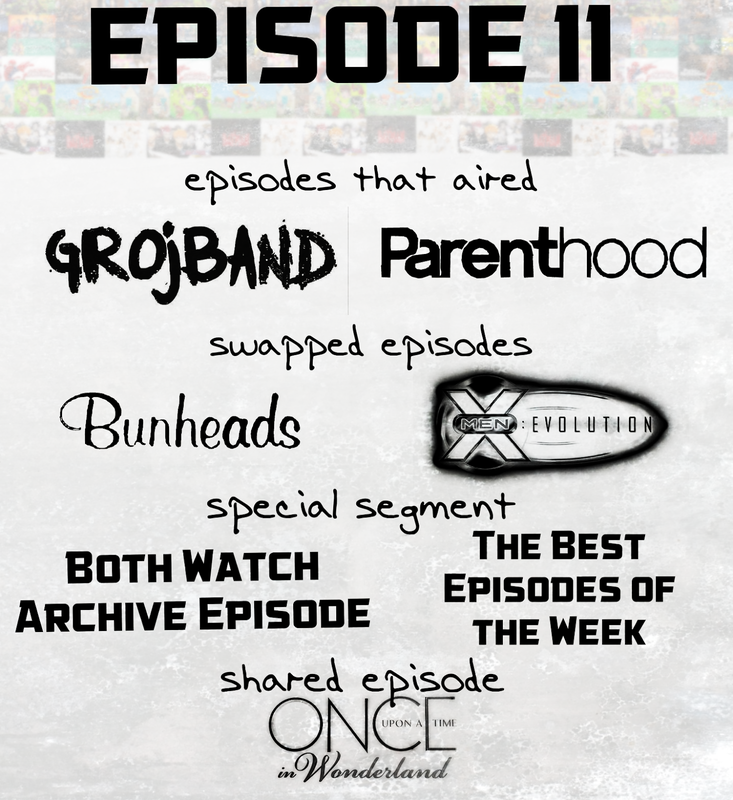 Next time, we'll be reviewing Grojband and Parenthood, and we'll be swapping the shows Bunheads and X-Men Evolution, and we'll both review Once Upon a Ttme in Wonderland. For the "feature", it'll be Both Watch Archive Episode Review, followed by the "accessory", The Best Episodes of the Week! Every week, two friends swap shows, review the latest episodes of shows they watch, and review the same episode of a show they both watch. Episodes are available on justin.tv, just click here! 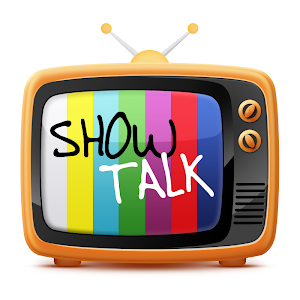 Watch Show Talk! Click the Image!